I just read in the Detroit Jewish News that two congregants of Adat Shalom Synagogue (the suburban Detroit shul where I grew up) have launched Am Yisrael Tie Company. They are selling neckties in three styles that all include an Israeli flag together with an American flag. Mickey Levin and Steven Zinderman came up with the idea at a rally for Israel last summer during Israel's war with Lebanon. 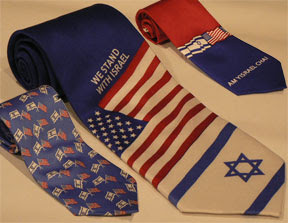 The ties are available by online ordering at TiesforIsrael.com. Most of the proceeds go to the Jewish National Fund. Unfortunately, just under the article about these ties for Israel was a news brief stating that four tzedakah boxes were stolen from a Detroit area Judaica store. One box was for the Frankel Jewish Academy of Detroit (Detroit's trans-denominational Jewish high school) and another was for the Friends of the Israel Defense Forces. How interesting that these articles sit on the same page one on top of the other. One article about some guys trying to do good and give to tzedakah, and another article about someone doing bad and stealing what was intended for tzedakah. Of course, the article about the ties for Israel was on top according to the Talmudic dictum ma'alin b'kodesh v'ein moridin - "You ascend in holiness and do not descend."